I follow Brazilian mandala artist, Mara Dias, on Instragram. 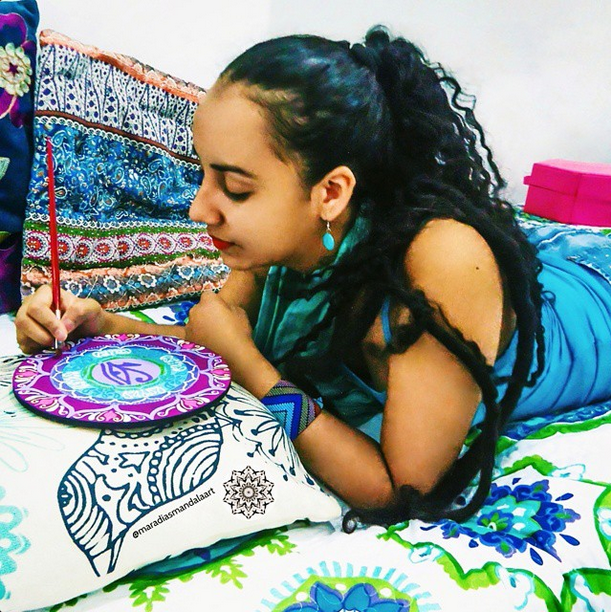 She creates beautiful, vibrantly-colored mandalas on a regular basis and posts her progress with each one. It’s a joy to view her art. The other day she posted a photo of herself painting one of her mandalas…I love this photo of her in action! Along with her paintings being colorful, it appears that everything around her is too. If you would want your mandala or your idea for a mandala to be considered for the “Mandala of the Day”, read about how on the Participate page. It’s easy!